Finding error coins in your daily pocket change can be fun and profitable; it's very easy to do. Develop good coin-checking habits from the very beginning and you may locate error coins and die varieties that are circulating right now. There are still many new discoveries waiting to be found. Magnifying glass or loupe. Suggested at least a 7X to 10X power. When you find an error coin or die variety that is worth keeping, you will want to store the coin properly to make sure it doesn't get damaged. If you take a structured approach to search your pocket change, this task can be completed quickly and efficiently. As you practice, you'll become quicker and quicker. Always examine your coins in batches of like coins. For instance, check all of your pennies, and then your nickels, then your dimes. Your eye will get used to seeing each type after the first couple of coins, so you can quickly scan them once your brain has become familiar. Also, you are more likely to notice differences from one coin to another when you check them in groups of like types. Don't get caught up in minutiae! If the doubling or other flaw is so insignificant that it is hard to see with a 10x loupe, it's usually not worth much. Look carefully for anything in the lettering that seems odd or unusual. Many doubled die varieties show doubling in only part of a word. Die abrasion, polishing, or greasy dirt collecting on the die face can cause letters to fail to strike accurately upon the coin. Turn the coin around and look at it from different angles. Check carefully for missing letters, doubling, and other oddities in the inscriptions. The date and mint mark should be a special focus of your attention because these are among the most valuable errors you are likely to find in circulation. Many things can go wrong in this area, including repunched mint marks and dates, overpunches, various types of doubling, and other errors. 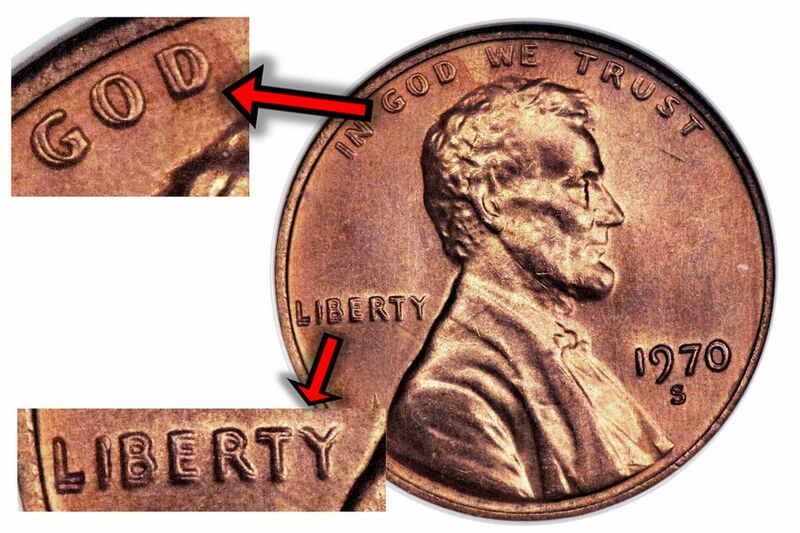 Note: If the mint mark or date is on the reverse side of the coin, (or the edge, as on the Presidential Dollars) don't turn the coin over to check now. Wait until you get to the reverse, but do be sure to check carefully when the time comes. Take a look at the coin's primary device, such as the portrait. Consider the obverse side of the coin as a whole. Is there visible doubling anywhere on the coin? You want to look for die cracks, cuds, and missing elements. Pay close attention to the portrait's eyes, ears, mouth, and chin, looking for signs of doubling. Be sure to look at the rim, too, watching for anything abnormal. Carefully and systematically turn the coin over from top to bottom (not side-to-side). If the coin was right-side up before turning it over, the reverse should be exactly right-side-up as well. The U.S. Mint takes great care to ensure that the die rotation on U.S. coins is correct, so coins which are significantly out of rotation are moderately valuable error coins. Get in the habit of checking rotation on every coin you handle. You don't want to miss the 180-degree rotation errors, as they are the most valuable of all! Following the same sequence as you used for the obverse, examine the reverse side of the coin, with the coin oriented upside down. Check the inscriptions and devices for any doubling, missing elements, or other oddness. Pay close attention to the mint mark, if present. Try tilting the coin at various angles to the light, which can sometimes make details easier to see. The final step in checking your coin should be to examine the edge. Roll the coin along your palm, so you can see all of the edge while you watch for seams, lines, missing reeded edges, and other abnormal factors of the edge. If the edge has letters, look for doubled or missing letters. Practice these steps until you can perform them very quickly. Each coin you examine should take no more than 15 to 20 seconds. When you get used to seeing the detail on different coin types, you'll develop an eye that will allow you to scan coins even quicker. Set aside any coins that you think might be different than normal so that you can examine them at your leisure under good lighting with strong magnification. At first, you might end up finding a lot of worthless varieties, but you'll be amazed at how much two seemingly alike coins can differ in the details! Don't get caught up trying to discern minor details. If the doubling, repunched mint mark, or die break cannot be seen easily and clearly under 10x magnification, the variety probably isn't worth much money. Get in the habit of tipping the coin at different angles to the light. Sometimes minor doubling can only be seen from a certain perspective. It can be helpful to get a couple of good reference books on error coins and die varieties written especially for beginners. For general information about mint errors and varieties, "The Official Price Guide to Mint Errors" by Alan Herbert is helpful. Another excellent book for beginners is "Strike It Rich With Pocket Change" by Ken Potter and Brian Allen. Both of the books contain many close-up images of what to look for on the coins, along with rarity and pricing information. Do You Have a Valuable Lincoln Memorial Penny? Are Two-Headed Coins Worth a Lot of Money?